I've just finished reading Anthony Archer's classic 'The Two Catholic Churches: a study in oppression' (see also my previous post). It is a fascinating book, imperfect in many ways but still containing some precious insights. The main idea is that the working class were betrayed by the changes to the liturgy, spirituality, and what we might call the general orientation of the Church, following the Second Vatican Council. This is such a surprising, and such a closely-argued claim, that it is worth a blog post. There is something rather dated about Archer's way of talking - all this stuff about working class culture is very redolent of the sociology of the 1970s. This is partly because that culture has, depending on your definition, either disapeared completely or become a much less significant part of our national life. There are, nevertheless, some very interesting critiques of post-war public policy from what we might call the 'old left', socialists who believed in the organic nature of society and the importance of the family, who were aghast at the effect on the working class by processes such as slum-clearance (and what replaced the slums) and de-industrialisation. Archer fits into this general trend. The first point is that, as Archer says, the Catholic Church was the only Christian church to hold the allegiance of significant numbers of the industrial working class in England. This is a fact of great significance and itself demands explanation. The explanation, in a nutshell, is that the Anglican church was so identified with the establishment that when Anglican farm workers moved to the cities to become factory hands, leaving the social structure of village life behind, with its pressures to go to church, they had no interest at all in practicing. The non-conformists were essentially lower-middle class. The Catholic Church of the 19th century had an appeal for the working class, both indiginous and Irish-immigrant, for two immediate reasons. It let everyone in: you didn't need to be wearing a smart suit of clothes. And it had considerable critical distance from the establishment. The latter was partly a matter of long-term persecution, but as time went on the old Catholic gentry hoped that they would be increasingly accepted by their peers. The great 19th century Churchmen took a different line: to the horror of some of the old families, as things got easier they didn't seek to blend in but to push the envelope with more exotic ritual, more Italianate churches, more assertive social teaching. The social teaching never had a chance to influence the state, but it was part of a set of distinctive values, a vision of what society should be like, at odds with the way society actually was. It was also linked to the great long-term project of Catholic restoration: the hierarchy, the splendid churches, the guilds, of the Middle Ages were to be built back up brick by brick. The ancientness of the liturgy was naturally essential in this appeal to the past. A tough-minded spirituality of perseverance in adversity was necessary to it also. The result was something appealing to the less comfortable members of society: the working class, and particularly the Irish, when they started arriving in large numbers with the potato famine of the 1840s. It was also appealing to a lot of intellectual converts, and indeed to many aspiring middle-class people. 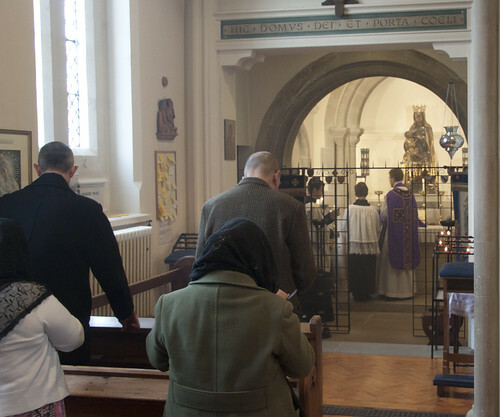 The traditional Mass, as I have quoted Archer as saying, enabled people to engage with it at many different levels. So did the whole structure of Catholic life and thought: from popular devotions right up to neo-Thomism, there was something for everyone. Archer's critique of the changes after Vatican II is based on the fact that the aspects of the Church which were most appealing to the working class were swept away, and what was brought in was appealing only to the educated and leisured middle class. Out went the Latin Mass in which everyone could engage at their own level; in came an English Mass where your engagement is supposed to be strictly controlled: exactly what the banal phrases mean, what responses to make, when to be friendly to your neighbour, etc.. Out went popular devotions, in came cliquely little groups at house-Masses, charismatic gatherings, or parish councils. Out went the Church as a sign of contradiction, an eccentric, exotic, refuge from society, where truth and authority were alone to be found; in came a Church in which the bishops talked as equals to Anglican bishops, and attended state functions. Out went the spirituality of perseverence in adversity; in came a way of 'finding Jesus' to escape from middle class problems such as lonliness and depression - or just hypochondria. The inspiration for the changes, after all, did not come from any attempt to find out what the bulk of Catholics wanted: it came from theologians, who wanted the respect of their Protestant colleagues. This is, as they say, an interesting angle on 'the changes'. I'll have more to say in a future post about Archer's assessment of the weaknesses of the pre-conciliar Church, and the social changes which undermined it. 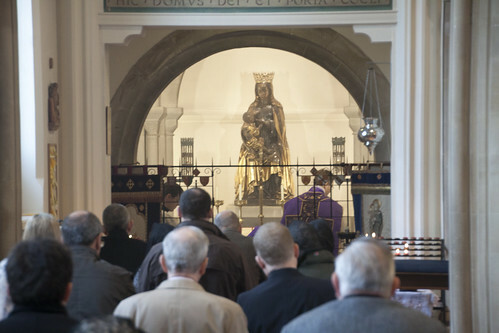 Pictures: Latin Mass Society Pilgrimage to Our Lady of Caversham. The shrine, and our Mass there, is a perfect example of the 'restoration model' abandoned after the Council. It is a restored medieval shrine, built as a Norman chapel on a Gothic church. The shrine image is a late-medieval one from Germany. The Mass we celebrated, and the chant we sang, would not have been too startling to medieval pilgrims. That is fascinating, thank you Joseph. The sentence "the working class were betrayed by the changes to the liturgy, spirituality, and what we might call the general orientation of the Church, following the Second Vatican Council." really caught my eye as it is exactly the way my mother speaks about the experience of the changes after the council! This phrase sums so much of it up. The theologians who drove through these changes are now seen in perspective to have been curiously behind the times. The Protestant Reformation had already run into the sands. They were chasing an illusion. The other major factor, I think, was the influence of the Neo-modernists with their goal of a lowest common denominator, Relativised, pan –Christian but ultimately meaningless amalgam, open to passing Secularist ideas. This latter we already see in the various “Protestant” bodies and sadly, increasingly within Catholicism. The poor old "working class" Catholics, not to mention the many ordinary intuitive Catholics, did not, and do not, have much of a chance. there are lots of parishes with a coterie of middle class people who see to run everything. there are also a lack of men and people in their twenties. I have a name for this: the embourgeoisification of the Church! Perhaps if I had read Anthony Archer's work previously (which I have not), I would not be puzzled by one passage here. Nevertheless one passage does in fact not merely puzzle me but astound me: "middle class problems such as loneliness and depression". Are we to understand from this remark that loneliness and depression are suffered exclusively by the bourgeoisie? I can only say that as a member of the pensioned-off underclass, I have been extremely familiar at first hand with both conditions. Direct quotations are in red, the rest is summary. The working class of the pre-Concilar era, and since, had more pressing problems than the kind middle-class people tend to take to shrinks, alternative therapists, or charismatic prayer groups. Which is not to say they don't have the less pressing ones as well. 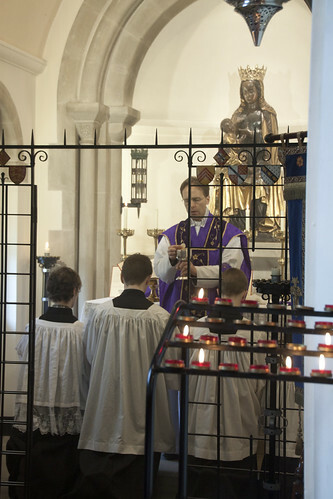 Over the past year we have been trying to bring a sense of genuine Catholicism/tradition back to St. Mary's Louth. We have tried to counteract all of the problems by creating a new community within the church whereby anyone can feel welcome. Ironically this has brought together mainly working class people who are now openly talking about Catholicism once again. 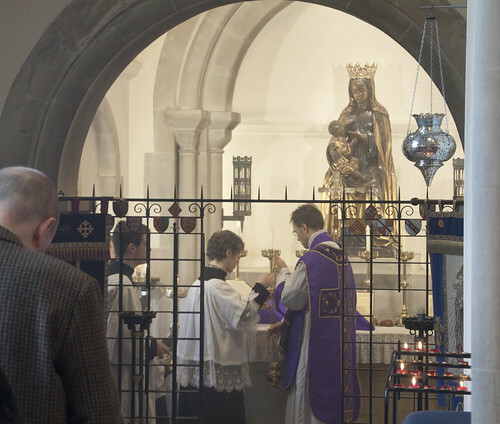 These are now the people who are helping to bring back the Crowning of Mary, attending adoration, and have even supported the return of the Traditional Latin Mass. In many ways St. Mary's is turning into an experiment in bringing back tradition and I would CLEARLY state (it may be of interest to you as the LMS Chairman) that the more power that has been handed back to the working class people in the church has resulted in the church becoming more Catholic. It has also resulted in bringing to the fore people who want the church to succeed. "We must strip from our Catholic prayers and from the Catholic liturgy everything which can be the shadow of a stumbling block for our separated brethren that is for the Protestants."